An IDF soldier donated his stem cells and saved the life of a man. This is the thirty second lifesaving transplant facilitated by the David & Sarah Farajun Donor Pool. An IDF soldier donated his stem cells and saved the life of a man. This is the thirty third lifesaving transplant facilitated by the David & Sarah Farajun Donor Pool. 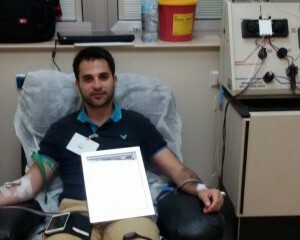 An IDF soldier donated his stem cells and saved the life of a man. This is the thirty fourth lifesaving transplant facilitated by the David & Sarah Farajun Donor Pool. A high tech employee donated his stem cells and saved the life of a man. This is the eighty eighth lifesaving transplant facilitated by the Ira & Ingeborg Rennert Donor Pool. A student donated his stem cells and saved the life of a baby boy. This is the eighty ninth lifesaving transplant facilitated by the Ira & Ingeborg Rennert Donor Pool. An event planner donated his stem cells and saved the life of a woman. This is the sixteenth lifesaving transplant facilitated by the Howard & Debby Jonas Donor Pool. An IDF soldier donated his stem cells and saved the life of a man. This is the first lifesaving transplant facilitated by the Arie & Dalia Prashkovsky Donor Pool. A Plasson factory employee donated her stem cells and saved the life of a man. This is the twenty third lifesaving transplant facilitated by the Daniel & Marlene Arbess Donor Pool. An IDF soldier who finished his service donated his stem cells and saved the life of a girl. This is the fifteenth lifesaving transplant facilitated by the Irving & Cherna Moskowitz Donor Pool. A student at the Tel Aviv – Yaffo Academic College donated her stem cells and saved the life of a man. This is the sixth lifesaving transplant facilitated by the Ezri & Ilana Namvar Donor Pool. A law student donated his stem cells and saved the life of a woman. This is the sixth lifesaving transplant facilitated by the Lewis Family Donor Pool. A man donated his stem cells and saved the life of a man. This is the sixtieth lifesaving transplant facilitated by the Alan Cohen Donor Pool. 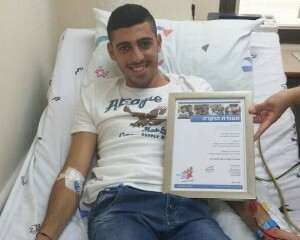 An IDF soldier donated his stem cells and saved the life of a teenaged boy. This is the first lifesaving transplant facilitated by the Fluk Family Donor Pool. A student at Ruppin Academic Center donated his stem cells and saved the life of a woman. This is the ninety first lifesaving transplant facilitated by the Brazil Community Donor Pool.